Now that Christmas is over and the New Year is coming, many of us are looking to get our house organized and clean. I spent the 26th cleaning out the kids closets and organizing their toys. I also had lots of clothes to wash from our trip to Grandma and Grandpa's house. I tried out the new Purex Triple Action formula that I was sent on the clothes. The first thing that I did was take a black permanent marker to mark the fill line on the cap. Extra laundry detergent is not good for your washing machine, not to mention that it is wasteful to use too much. I have a hard time seeing the line on the caps so I always mark the line with a thick black line so I don't use too much. Just a little tip from me to you to actually get the number of loads of laundry cleaned that it says on the bottle. I am happy to report that all the stains came out and that the clothes smelled fresh. There is no sign of the chocolate chip cookies that were all over Isabella's shirt. And none of the colors faded off the new clothes they got fr Christmas. 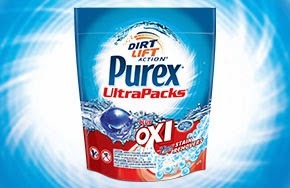 And while I do not have a HE washer, Purex Triple Action formula is rated for HE washers so you can use this detergent regardless of the type of washer you own. And the best part is that Triple Action formula cleans your clothes for less than half the price of the leading brand. Beginning in early 2012, you can request a sample of the new Triple Action formula and give it a try for yourself. Visit http://www.FreeSamplePurex.com to request your free sample, I'm sure you'll be just as pleased as I am. Disclaimer-I received a free bottle of Purex Triple Action formula detergent in exchange for my review. All opinions are 100% mine and no further compensation was provided.